Voglio quel gilet! Troppo bello Lilli! Poi abbinato così è ancora più favoloso. Su insta ti go s ritto che adoro il cappello..ora aggiungo anche gli stivali. Che bella Lilli , adoro il tuo cappello! Un bacione. Che bello quel gilet Lilli, sei super trendy e molto raffinata... adoro il cammello abbinato al nero! The vest is my favourite element but I also like the matching jewellery! Ciao, mi piace molto questa parure che indossi…frange ovunque oramai!! 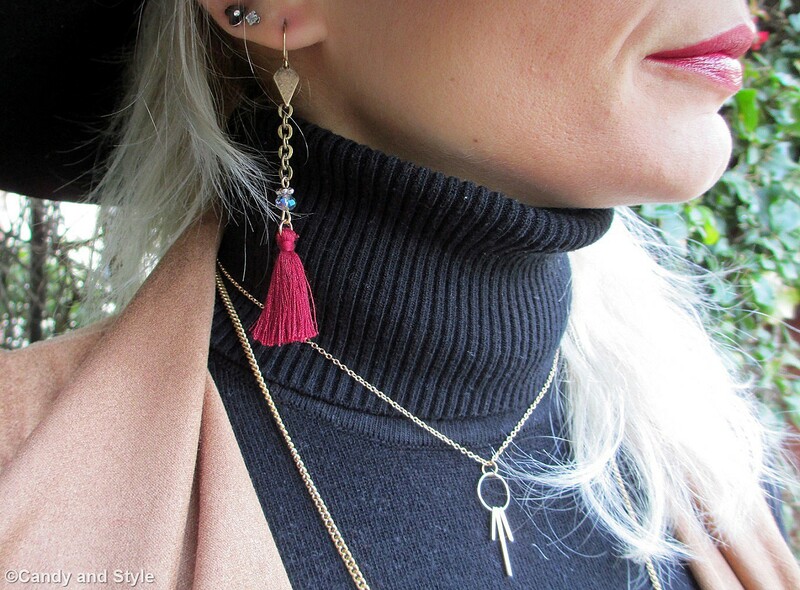 I really like how you combined tassels and fringe in this look Lilli! They complement each other so well and the whole outfit is just so chic and elegant. You always have the best accessories! Sei splendida, mi piace l'abbinamento e poi il gilet con le frange è bellissimo! Lilli, ma che bella sei con questo cappello? Mi piaci un sacco e mi piace moto anche quel gilet. Bella davvero! Nero e cammello stanno davvero bene insieme e. Quel gilet!!! Very stylish Lilli. You are definitely looking so boho chic. 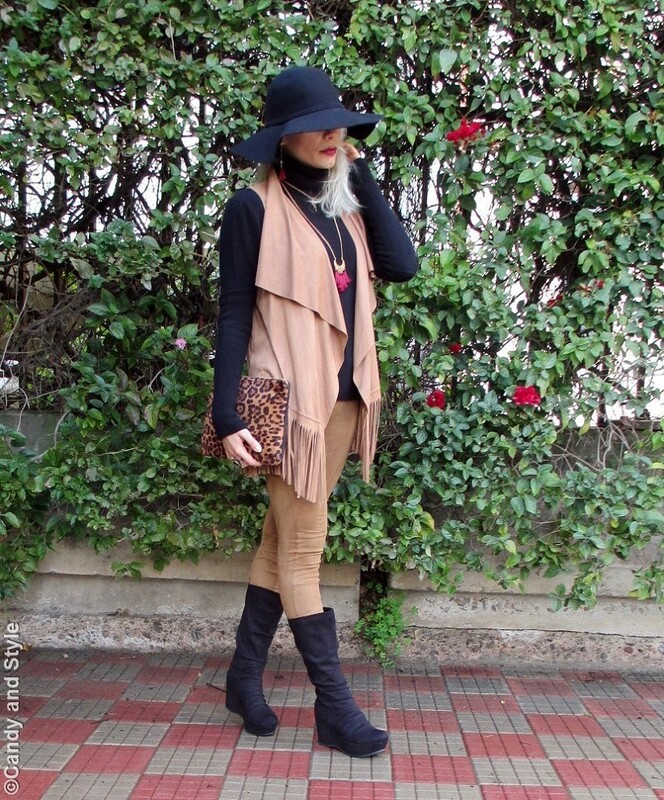 Your wedge boots and tassels look great together. Loving that vest Lilli. And loving the black contrasting against the camel tones. Gorgeous styling as per usual! Lovely Outfit; I like the combination of colors and textures. Also, the jewelry is so beautiful. My dear Lilli, yet you did it again. Loving this winter-ish boho combo especially with that great hat and cool boots. 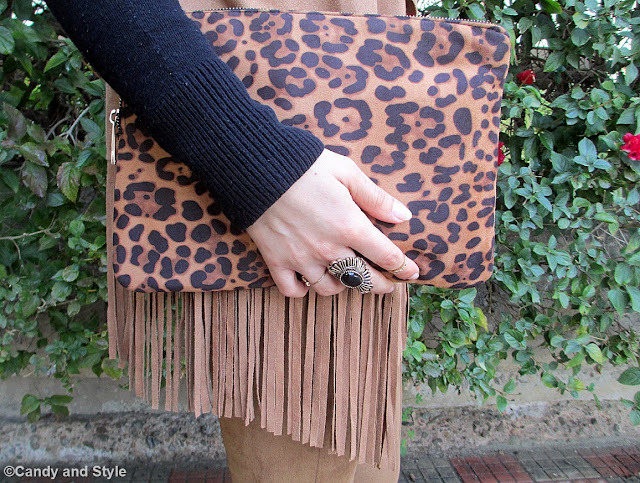 Because of the leo print, I instantly fel in love with the bag. Bellissima cara mia! Buona settimana , bacione! so boho! so edgy! so chic and elegant! perfect look!